The tree of life or universal tree of life is a metaphor, model and research tool used to explore the evolution of life and describe the relationships between organisms, both living and extinct, as described in a famous passage in Charles Darwin's On the Origin of Species (1859). The affinities of all the beings of the same class have sometimes been represented by a great tree. I believe this simile largely speaks the truth. Tree diagrams originated in the medieval era to represent genealogical relationships. Phylogenetic tree diagrams in the evolutionary sense date back to at least the early 19th century. The term phylogeny for the evolutionary relationships of species through time was coined by Ernst Haeckel, who went further than Darwin in proposing phylogenic histories of life. 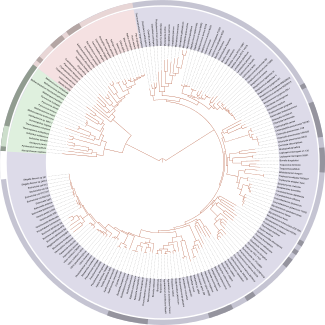 In contemporary usage, tree of life refers to the compilation of comprehensive phylogenetic databases rooted at the last universal common ancestor of life on Earth. The Open Tree of Life, first published 2015, is a project to compile such a database for free public access. Although the mutability of species may have appeared in paintings and trees have been used as a metaphor for other purposes (Porphyrian tree) earlier than 1800, the combination of the concept of branching evolution and the tree image did not appear before 1800. The earliest tree of life was published by the French botanist Augustin Augier in 1801. It shows the relationships between members of the plant kingdom. Jean-Baptiste Lamarck (1744–1829) produced the first branching tree of animals in his Philosophie Zoologique (1809). It was an upside-down tree starting with worms and ending with mammals. However, Lamarck did not believe in common descent of all life. Instead, he believed that life consists of separate parallel lines advancing from simple to complex. The American geologist Edward Hitchcock (1793–1864) published in 1840 the first tree of life based on paleontology in his Elementary Geology. On the vertical axis are paleontological periods. Hitchcock made a separate tree for plants (left) and animals (right). The plant and the animal tree are not connected at the bottom of the chart. Furthermore, each tree starts with multiple origins. Hitchcock's tree was more realistic than Darwin's 1859 theoretical tree (see below) because Hitchcock used real names in his trees. It is also true that Hitchcock's trees were branching trees. However, they were not evolutionary trees, because Hitchcock believed that a deity was the agent of change. That was an important difference with Darwin. The first edition of Robert Chambers' Vestiges of the Natural History of Creation, which was published anonymously in 1844 in England, contained a tree-like diagram in the chapter "Hypothesis of the development of the vegetable and animal kingdoms". It shows a model of embryological development where fish (F), reptiles (R), and birds (B) represent branches from a path leading to mammals (M). In the text this branching tree idea is tentatively applied to the history of life on earth: "there may be branching", but the branching diagram is not displayed again specifically for this purpose. However, the image of a branching tree could easily have inspired others to use it explicitly as a representation of the history of life on earth. In 1858, a year before Darwin's Origin, the paleontologist Heinrich Georg Bronn (1800–1862) published a hypothetical tree labeled with letters. Although not a creationist, Bronn did not propose a mechanism of change. The affinities of all the beings of the same class have sometimes been represented by a great tree. I believe this simile largely speaks the truth. The green and budding twigs may represent existing species; and those produced during each former year may represent the long succession of extinct species. At each period of growth all the growing twigs have tried to branch out on all sides, and to overtop and kill the surrounding twigs and branches, in the same manner as species and groups of species have tried to overmaster other species in the great battle for life. The limbs divided into great branches, and these into lesser and lesser branches, were themselves once, when the tree was small, budding twigs; and this connexion of the former and present buds by ramifying branches may well represent the classification of all extinct and living species in groups subordinate to groups. Of the many twigs which flourished when the tree was a mere bush, only two or three, now grown into great branches, yet survive and bear all the other branches; so with the species which lived during long-past geological periods, very few now have living and modified descendants. From the first growth of the tree, many a limb and branch has decayed and dropped off; and these lost branches of various sizes may represent those whole orders, families, and genera which have now no living representatives, and which are known to us only from having been found in a fossil state. As we here and there see a thin straggling branch springing from a fork low down in a tree, and which by some chance has been favoured and is still alive on its summit, so we occasionally see an animal like the Ornithorhynchus or Lepidosiren, which in some small degree connects by its affinities two large branches of life, and which has apparently been saved from fatal competition by having inhabited a protected station. As buds give rise by growth to fresh buds, and these, if vigorous, branch out and overtop on all sides many a feebler branch, so by generation I believe it has been with the great Tree of Life, which fills with its dead and broken branches the crust of the earth, and covers the surface with its ever branching and beautiful ramifications. The meaning and importance of Darwin's use of the tree of life metaphor have been extensively discussed. Stephen Jay Gould, for example, says that Darwin placed the famous passage quoted above "at a crucial spot in his text", where it marked the conclusion of his argument for natural selection, illustrating both the interconnectedness by descent of organisms as well as their success and failure in the history of life. David Penny has written that Darwin did not use the tree of life to describe the relationship between groups of organisms, but to suggest that, as with branches in a living tree, lineages of species competed with and supplanted one another. Petter Hellström has demonstrated that Darwin consciously chose to name his tree after the biblical tree of life, as described in Genesis, thus relating his theory to Christian mythology, and suggesting that he did so to mobilise the imagination of his readers. Ernst Haeckel (1834–1919) constructed several trees of life. His first sketch (in the 1860s) of his famous tree of life shows "Pithecanthropus alalus" as the ancestor of Homo sapiens. His 1866 tree of life from Generelle Morphologie der Organismen shows three kingdoms: Plantae, Protista and Animalia. His 1879 'Pedigree of Man' was published in The Evolution of Man. In 1990, Carl Woese, Otto Kandler and Mark Wheelis proposed a "tree of life" consisting of three lines of descent for which they introduced the term domain as the highest rank of classification. They also suggested the terms bacteria, archaea and eukaryota for the three domains. The model of a tree is still considered valid for eukaryotic life forms. 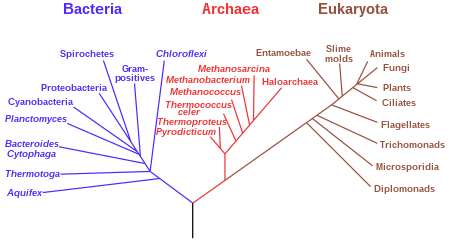 As of 2010[update], research into the earliest branches of the eukaryote tree has suggested a tree with either four or two supergroups. There does not yet appear to be a consensus; in a review article, Roger and Simpson conclude that "with the current pace of change in our understanding of the eukaryote tree of life, we should proceed with caution." In 2015, the first draft of the Open Tree of Life was published, in which information from nearly 500 previously published trees was combined into a single online database, free to browse and download. 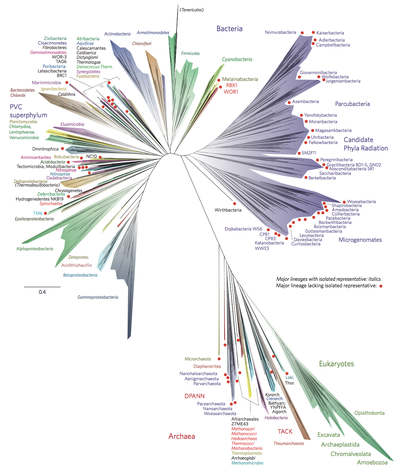 In 2016, a new tree of life, summarizing the evolution of all known life forms, was published, illustrating the latest genetic findings that the branches were mainly composed of bacteria. The new study incorporated over a thousand newly discovered bacteria and archaea. The prokaryotes (the two domains of bacteria and archaea) and certain animals such as bdelloid rotifers and the tardigrade have the ability to transfer genetic information between unrelated organisms through horizontal gene transfer. Recombination, gene loss, duplication, and gene creation are a few of the processes by which genes can be transferred within and between bacterial and archaeal species, causing variation that is not due to vertical transfer. There is emerging evidence of horizontal gene transfer within the prokaryotes at the single and multicell level, so the tree of life does not explain the full complexity of the situation in the prokaryotes. ^ Hug, Laura A.; Baker, Brett J.; Anantharaman, Karthik; Brown, Christopher T.; Probst, Alexander J.; Castelle, Cindy J.; Butterfield, Cristina N.; Hernsdorf, Alex W.; Amano, Yuki; Ise, Kotaro; Suzuki, Yohey; Dudek, Natasha; Relman, David A.; Finstad, Kari M.; Amundson, Ronald; Thomas, Brian C.; Banfield, Jillian F. (11 April 2016). "A new view of the tree of life". Nature Microbiology. 1 (5): 16048. doi:10.1038/nmicrobiol.2016.48. PMID 27572647. ^ Mindell, D. P. (3 January 2013). "The Tree of Life: Metaphor, Model, and Heuristic Device". Systematic Biology. 62 (3): 479–489. doi:10.1093/sysbio/sys115. PMID 23291311. ^ Darwin, Charles (1859). "Four: Natural Selection; or the Survival of the Fittest". On the origin of species by means of natural selection, or, The preservation of favoured races in the struggle for life (First Edition, First Thousand ed.). London: John Murry. p. 129. Retrieved 11 August 2018. ^ Peter J. Bowler (2003) 'Evolution. The History of an Idea', third edition, p.90-91. ^ Archibald, J. David (2009). "Edward Hitchcock's Pre-Darwinian (1840) 'Tree of Life'". Journal of the History of Biology. 42 (3): 561–592. CiteSeerX 10.1.1.688.7842. doi:10.1007/s10739-008-9163-y. ^ (Chambers, 1844), p. 212. ^ (Chambers, 1844), p. 191. ^ Chambers, Robert (1844). Vestiges of the Natural History of Creation. London, England: John Churchill. ^ Bronn, H.G. (1858). Untersuchungen über die Entwicklungs-Gesetze der organischen Welt während der Bildungs-Zeit unserer Erd-Oberfläche [Investigations of the laws of the development of the organic world during the period of formation of our Earth's surface] (in German). Stuttgart, (Germany): F. Schweizerbart. pp. 481–482. ^ Archibald, J. David (2009). "Edward Hitchcock's Pre-Darwinian (1840) 'Tree of Life'". Journal of the History of Biology. 42 (3): 568. CiteSeerX 10.1.1.688.7842. doi:10.1007/s10739-008-9163-y. ^ Penny, D. (2011). "Darwin's Theory of Descent with Modification, versus the Biblical Tree of Life". PLoS Biology. 9 (7): e1001096. doi:10.1371/journal.pbio.1001096. PMC 3130011. PMID 21750664. ^ Petter Hellström, Nils (2012). "Darwin and the tree of life: the roots the evolutionary tree". Archives of Natural History (Submitted manuscript). 39 (2): 234–252. doi:10.3366/anh.2012.0092. ^ Woese, Carl R.; Kandler, O; Wheelis, M (1990). "Towards a natural system of organisms: proposal for the domains Archaea, Bacteria, and Eucarya". Proc Natl Acad Sci USA. 87 (12): 4576–9. Bibcode:1990PNAS...87.4576W. doi:10.1073/pnas.87.12.4576. PMC 54159. PMID 2112744. ^ "First comprehensive tree of life shows how related you are to millions of species"
^ Zimmer, Carl (11 April 2016). "Scientists Unveil New 'Tree of Life'". New York Times. Retrieved 11 April 2016. ^ Taylor, Ashley P. (11 April 2016). "Branching Out: Researchers create a new tree of life, largely comprised of mystery bacteria". The Scientist. Retrieved 11 April 2016. ^ Hug, Laura A.; Baker, Brett J.; Anantharaman, Karthik; et al. (11 April 2016). "A new view of the tree of life". Nature Microbiology. 1 (5): 16048. doi:10.1038/nmicrobiol.2016.48. PMID 27572647. ^ Watson, Traci (15 November 2012). "Bdelloids Surviving on Borrowed DNA". Science/AAAS News. ^ Koutsovoulos, Georgios; Kumar, Sujai; Laetsch, Dominik R.; Stevens, Lewis; Daub, Jennifer; Conlon, Claire; Maroon, Habib; Thomas, Fran; Aboobaker, Aziz (2015-12-13). "The genome of the tardigrade Hypsibius dujardini". bioRxiv 033464. ^ Doolittle, W. Ford (2000). "Uprooting the tree of life" (PDF). Scientific American. 282 (6): 90–95. Bibcode:2000SciAm.282b..90D. doi:10.1038/scientificamerican0200-90. Archived from the original (PDF) on 2006-09-07. Doolittle, W. F.; Bapteste, E. (2007). "Inaugural Article: Pattern pluralism and the Tree of Life hypothesis". Proceedings of the National Academy of Sciences. 104 (7): 2043–2049. Bibcode:2007PNAS..104.2043D. doi:10.1073/pnas.0610699104. PMC 1892968. PMID 17261804. Science journal issue - Issue devoted to the tree of life. The Tree of Life by Garrett Neske, The Wolfram Demonstrations Project: "presents an interactive tree of life that allows you to explore the relationships between many different kinds of organisms by allowing you to select an organism and visualize the clade to which it belongs."